The crucial innovation of digital advertising is that it is so much more customizable than traditional print, radio, and television advertising. Digital ads are infinitely more targetable for your particular audience and can be tailored to any budget. Traditional media, by contrast, offers set rates for predetermined ad sizes (in the case of print) and ad duration (in the case of radio and television). If your business has an online presence that you are proud of - an effective website and active social media profiles - digital advertising is the best way to capitalize on it. But you need a well-thought-out approach to ensure a worthwhile return on your spend. 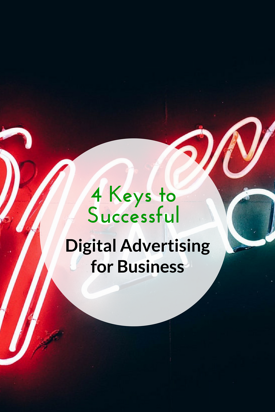 Follow these four guidelines to build a successful digital advertising for business campaign. Any business should have an effective read on its target audience. But not every business realizes that knowledge can be translated into productive digital advertising. Base your decision about how to advertise online on where your target audience is spending its time online. Businesses selling to consumers, for example, will find fertile ground on Facebook and Instagram. Business-to-business companies are better off taking advantage of LinkedIn’s advertising opportunities. Your audience’s geography should also inform your ad buy choices. Geographic targeting is one of the unique strengths of social media advertising. Google’s Adwords platform creates opportunities to reach people who are searching for products and services like yours at the exact time they are looking. Breaking into Google Adwords means choosing the keywords, or search terms, you are hoping to rank high for on Google’s search results pages. Be ready for competitive bidding for popular or generic keywords. It takes a bigger budget to break into the top of search result pages for these. Instead, we recommend honing in on the specific keywords that describe your unique selling proposition - using your particular geography, in the case of local businesses. This will lower the bidding landscape and allow you to get more out of your Adwords dollar. Another effective digital advertising strategy is to track the people who visit your website and present display ads to them during their subsequent web surfing. This “remarketing” technique was pioneered by large online retailers like Zappos and Amazon, but it’s accessible to all business websites, with the use of a small piece of tracking code embedded on your site. Google Adwords offers a remarketing service that is integrated with its Adwords platform. If your business has active social media profiles, launching your digital advertising campaign here will probably be the most intuitive way to start. Social platforms are great for any advertising budget and any target audience. They offer granular targeting that puts your ad in front of only the people you are looking to reach, based on their demographics, geography and interests. Whether it’s search or social media, your ad spend will be based on factors that you determine. If you are making a play for popular search terms, be prepared for a rich bidding market. Similarly, if you are choosing broad demographic and geographic criteria on your social media ads, they will be big purchases. Always start with a reasonable budget when you begin your campaign. As you collect data, you will be able to refine it. Ideally your campaign will become more effective and increase the ROI (return on investment) for you. Another aspect of digital advertising is the budget per click. You get all kinds of data back on your campaign that can be used to refine your campaign to get the best ROI. In regards to your budget you should have an idea of how many clicks you convert to deals (i.e. one out of 10 clicks is closed deal) and how much you would like to spend on marketing per deal. Say you are paying $2 per click, then you are spending $20 per closed deal. When your campaigns start, you will probably be in the red on your clicks, but you should be able to bring it into the black as the campaign is refined. So your ad did its job and enticed prospects to click through. Where did they end up? Creating a unique landing page aligned in message with the ad is a critical piece of digital advertising. An effective landing page builds on the message of your ad and offers a way for your prospects to deepen their relationship with your company. A great place to learn about designing effective landing pages is the blog at unbounce.com. Follow these guidelines to develop a digital advertising strategy that works for your budget and business goals. There are many potential pitfalls and caveats to managing your own campaigns. I have seen more than one campaign that was set up incorrectly and the client’s ad spend was wasted without any success. I highly recommend taking one of the online courses on digital advertising (there are several on youtube.com) before you attempt to run your own campaign. If your business is growing and you want to focus on running your business and not learning something else, I highly recommend you find a professional to setup and manage your campaigns for you. Breezy Hill is a Certified Google Partner who runs campaigns on multiple platforms. We would be happy to meet with you to design your ads, define your goals and and create your best targeting strategy with you. Breezy Hill Marketing is a Vermont web design company offering responsive Web Design, inbound marketing, social media marketing, and marketing strategy for clients throughout the United States. We work closely with our clients to craft strategies specific to their needs.